The man heading the multi-million pound regeneration of Camborne, Pool and Redruth is resigning. Dr Tim Williams has run the £150m Camborne, Pool and Redruth Urban Regeneration Company for two years. He had previously been in charge of the Thames Gateway London Partnership which was the biggest project of its kind in the country. The company says he has been headhunted to be a special adviser in the Office of the Deputy Prime Minister. The Camborne, Pool and Redruth Urban Regeneration Company was set up to try to reverse generations of decline in Cornwall's former industrial heartland. Among the aims is to create about 2,500 jobs over the next four years. 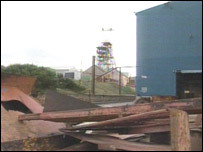 It is a challenging task with unresolved problems including the long-term fate of the key South Crofty site. In a statement the company said; "Dr Tim Williams, chief executive of CPR Regeneration, has accepted an invitation to become the special advisor to David Miliband, the new Cabinet Minister for Communities at the Office of the Deputy Prime Minister. "Dr Williams said his appointment was a great opportunity to promote the cause of Camborne, Pool and Redruth, Cornwall and the wider South West from the heart of Government." "He said his priority in the coming months was to continue to build on the momentum of CPR Regeneration, which is widely regarded as one of the best urban regeneration companies in the country, while preparing for a smooth handover to his successor." More details about his departure date should be released later next week but he is not expected to leave for several months. The company is beginning a search for a replacement.